MITZPE RAMON, ISRAEL–Today I worked in the Jurassic of Makhtesh Gadol and the Triassic of Makhtesh Ramon. A highlight was that I was joined by Yael Leshno, an Israeli master’s student on her way to a paleontology career. She was very good at finding crinoid parts in the Matmor Formation. Otherwise it was a dusty, windy, non-photogenic day. 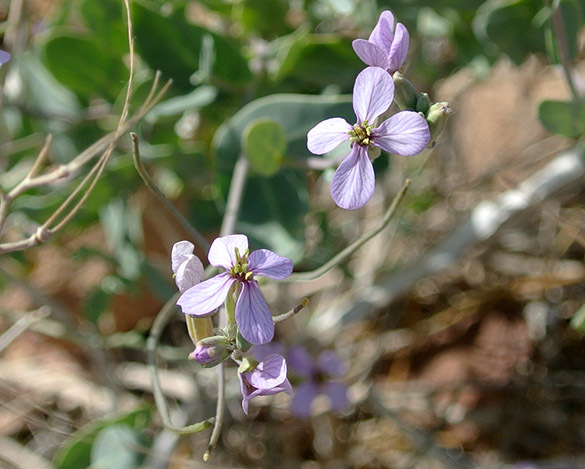 Time to post wildflower images! There must be an interesting pollinator for this plant. James in the comments identified this flower as Echium judaeum. Thanks! I know I’ve identified this plant before, but the name now escapes me. It tends to be in moister parts of wadis. 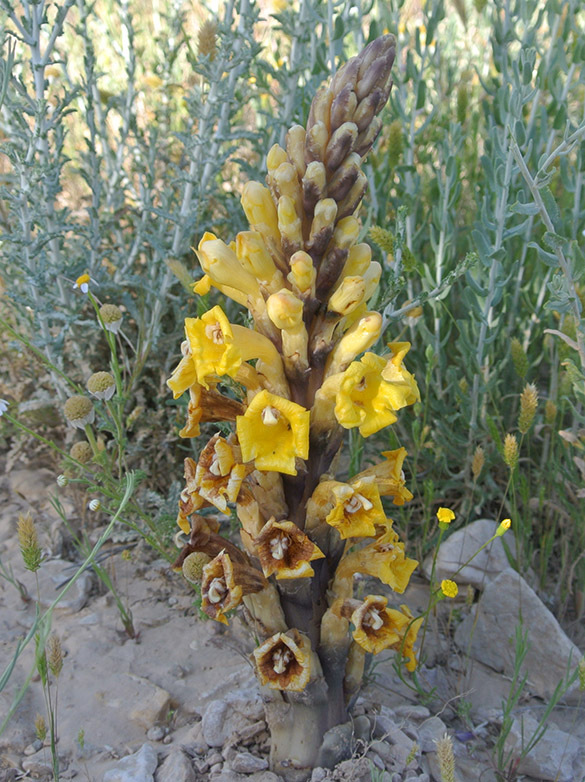 It might be Broomrape (Cistanche tubulosa), a parasitic plant that taps the roots of other plants. This I learned is the Stork’s Bill (Erodium cicutarium). It is native to the Mediterranean and was introduced to North America over 200 years ago (and is now an invasive pest in some places). 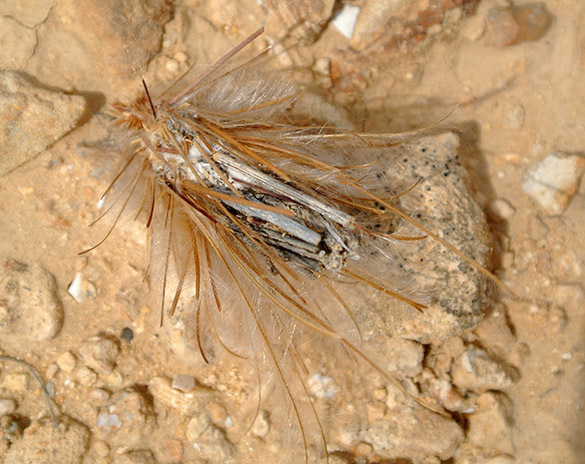 It has a very impressive way of distributing its seeds, one of which is shown in the center of this image. 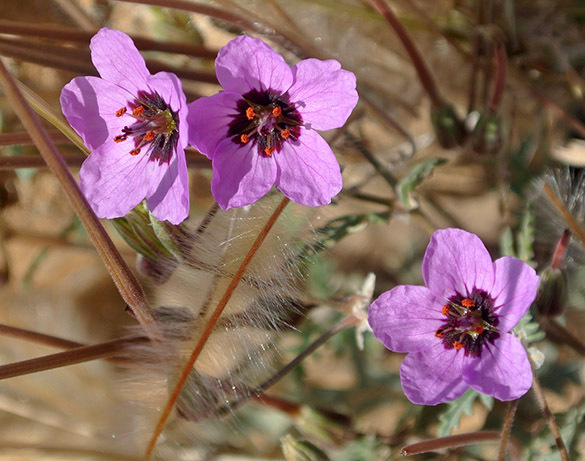 The seeds of the Stork’s Bill are so common this spring that they blow around the desert landscape like snow. 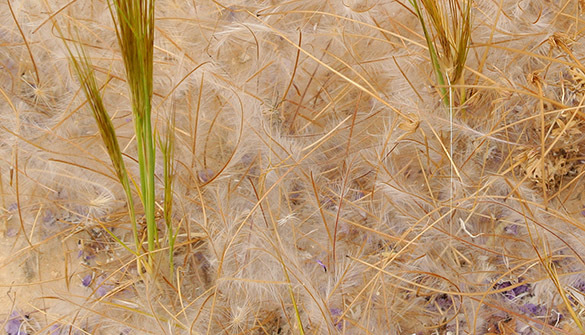 Each has a feathery shaft to catch the wind, and then a screw-like device that enables the seed to bury itself in the soil with changing humidity and the action of the wind on the shaft. This Wikipedia page on the plant has images of the seeds. Very r-selected! Which brings me to this odd creature. You see here a collection of Stork’s Bill seeds bound together like a sheaf of wheat. 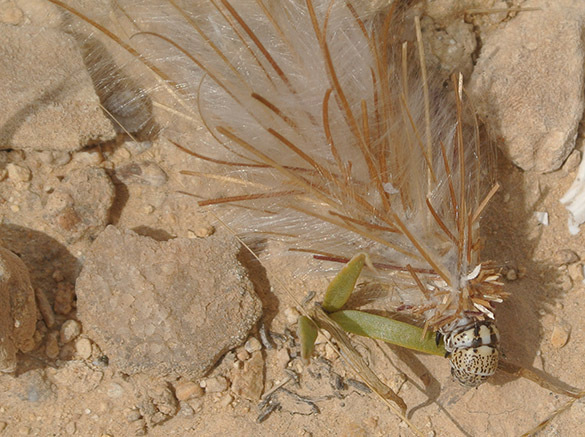 In the lower right is the head of a caterpillar-like arthropod seeming to carry it along. When I touched it the head retreated into the seed mass. I don’t know the name of the shade of yellow, Laura, but I’m sure it can be found just about anywhere flowers grow. Your red flower is Echium judaeum. 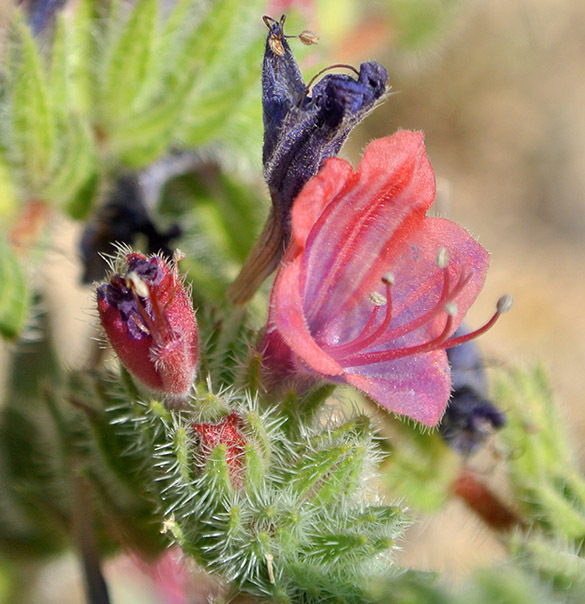 Echium flowers are resupinate (upside down). 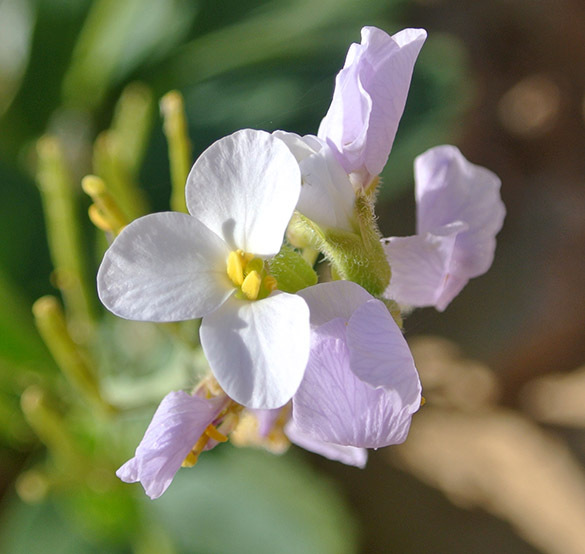 Note how the stamens and stigma project from the upper lip (bottom) of the flower. Thank you very much, James! I shall update the post. Love learning more this way.